This is the first year I have maintained a real garden. I've dabbled in container gardening over the last couple years with moderate success. Usually I'm ambitious in the beginning and give my plants all kinds of attention, and then life takes over and I forget about them for a while...which is a nice way to say I've spent the last couple years killing my garden. This year was going to be different. I was unemployed, aka lots of time on my hands. I rented a house with a backyard that had this gorgeous plot. Well, I made it gorgeous, it started out as a weed pile. But I cleaned it up, spent days in that plot pulling weeds, replacing the soil, planting my starts. So I was determined to keep up with it this year! Before and after. : removing weeds from the garden plot. A labor of love people, this took a loooooooong time. Last year, I had one zucchini plant in a container, and between failure to water and failure to fertilize, that plant died before yielding any fruit. I take full responsibility. So this year, I bought six squash plants. I figured if five of them died, I would still have one that would hopefully yield one lonely squash all year. Good logic, right? Well I must have done something right this year, because ALL six plants have yielded an amazing amount of squash! This size harvest happened on the regular, almost every week in August we had this much squash! When you have a squash plant, your squash will grow rampant. Seriously. Before you know it, you have way more than you know what to do with. So I made zucchini pasta primavera, grilled zucchini, roasted zucchini, zucchini succotash, zucchini carpaccio, you name it, I put zucchini in it. But what can I say, I get bored pretty easily...so I wanted to do something different, something fun: zucchini bread French toast. Why not? 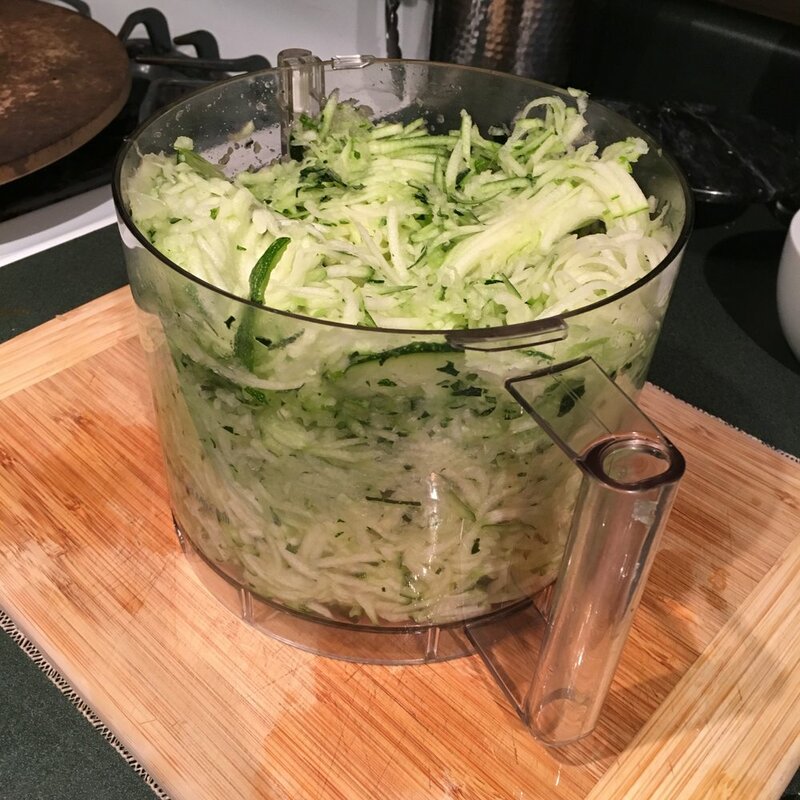 First step: make the zucchini bread, and a lot of it. Second step, slice and freeze it. Third step: french toast whenever I want! In smaller zucchini, the seeds generally don't need to be removed, but that's a 7" blad santoku knife pictured, so I definitely removed the seeds on this guy! Mix juuuuuuuust until it comes together, and no longer, for best texture! Oven temperature needs to be increased by 15°, and similarly baking time needs to be decreased 5-8 minutes per 30 minutes of original cooking time to compensate for the higher oven temp. Liquids should be increased 1TB per 3,000 feet, with an additional 1.5tsp for every additional 1,000 feet. Sometimes, you can add an extra egg and not worry about the liquid increase. Use your best judgment, if you think the recipe could benefit from an extra egg, go for it! In a large bowl, mix all the wet ingredients: combine egg, both oils, grated zucchini, yogurt, vanilla, and sugar. Mix until sugar is melted and everything is well combined. In a separate bowl, mix all the dry ingredients: flour, salt, baking soda, baking powder, and cinnamon. Whisk until well combined. Slowly pour the dry ingredients into the wet ingredients, whisking while you pour. Be careful not to overmix: stop mixing as soon as you no longer see clumps of flour in the mix. Bake 45 minutes. I utilize the toothpick test to see if it's done: insert a wooden toothpick (or the tines of a metal fork if you don't have any toothpicks) into the center of the bread. If the toothpick comes out clean, without wet batter clinging to it, you're done! If not, bake an additional 5 minutes and test again. Remove from the pan and cool on a baking rack until completely cool. Check out the next post for the step-by-step on turning this delicious bread into French toast!